This is a 1966 Chevrolet Custom Cab short bed pickup. 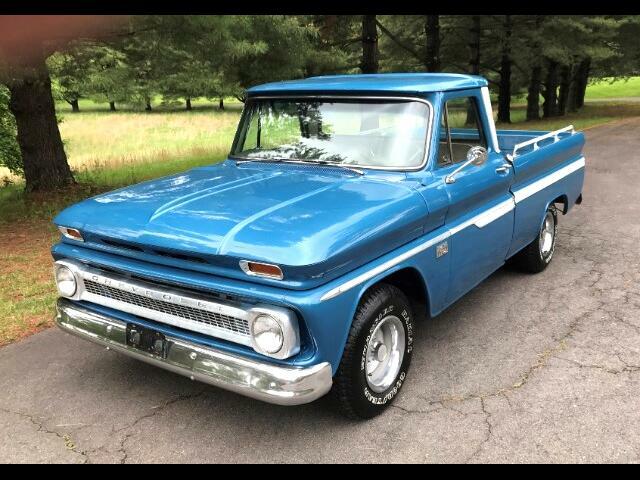 It has the original 283ci V8 engine, Powerglide transmission, custom cab with all exterior decor trim, big back window, truck Rally wheels, dual exhaust, chrome bumpers front and rear, chrome grille and wood bed. Totally complete truck with very hard to find Custom cab, big back window and factory V8. We just had the truck re-painted, refinished seat, detailed engine compartment, new rear bumper, new set of Goodyear Wrangler RWL radiall tires and new windshield, with new weatherstrip. Message: Thought you might be interested in this 1966 Chevrolet C10. As you can see from the pictures of the undercarriage on this truck, it is rock solid with no patches ,in floor or frame, inner rockers, are all solid with only light surface rust.